The 2019 Audi Q7 is a powerful SUV that is geared for performance as well as luxury. This model has a lot to show its drivers. We want to tell you more about how this vehicle can be a great candidate in your search for your next vehicle. Let’s see what this vehicle can do. The 2019 Audi Q7 comes standard with a 2.0-liter four-cylinder engine. This engine delivers 248 horsepower and 273 pound-feet of torque. It can reach 60 mph in 7.1 seconds. The Audi Q7 also has an available 3.0-liter six-cylinder engine. This performance technology can help you get onto the highway without holding back traffic. It can go from 0 to 60 mph in 5.7 seconds. There are a lot of other features to look at when it comes to this vehicle. Let’s take a look. The 2019 Audi Q7 is ready to take on the road. It has the features that you want and even some that you didn’t know it had. We want to show you the key features of this vehicle. Let’s see what it has to offer. 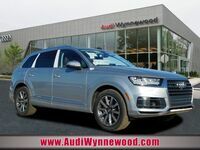 If you would like to learn more about the 2019 Audi Q7 or any of our other vehicles, you can check out our online inventory and schedule a test drive with us at Audi of Wynnewood today. Interested in a 2019 Audi Q7?